This versatile Cocktail Table features a standard table height column and bar height column. 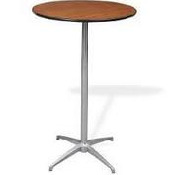 This round bistro or cocktail style folding table can be used as a high table at a 42” height, 36” or at the standard 30” options allow you to optimize your resources when setting up for different events. Enhance the look of the cocktail table configuration by adding a table cover and your own flare! Other Fee: When renting Tables there is an $95 Delivery Fee, if not rented with Tents or Inflatables. There is an additional charge for Tables Setup, $1/table as setup & takedown fee.